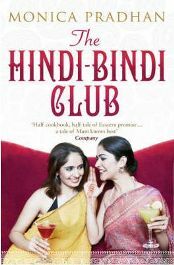 The Hindi-Bindi Club is a tale of six women three mothers and their three adult daughters all living in the USA. The mothers were born in India and moved to the USA for education or marriage, whilst the daughters are all Americans born and bred. Whilst they were still children, the daughters nicknamed the group of friends of which their mothers were all members as the Hindi-Bindi Club. All six women have ‘issues’ Saroj is having an affair, Meenal is recovering from breast cancer, and Uma yearns to see her old pre-Partition home in Lahore but fears to go to Pakistan as an Indian-born traveller. And of course they all worry about their daughters, some with more reason than others. The daughters are all successful women a marketing exec, a rocket scientist turned artist (yes, I found that one a bit hard to swallow) and a doctor fine examples of the Indian immigrant dream come true. But like their mothers, the daughters have their problems too. Kiran the doctor has divorced her American musician husband who had ‘commitment issues’ which is a nice way of saying he screwed around. Rani the rocket scientist has just had her first solo art exhibition but is a long term sufferer of the severe depression that dogs the women of her family and killed her grandmother. She thinks she has lost her ‘muse’. Preity, the perfect girl with a perfect blond god Scandinavian husband and gorgeous fair skinned children, still years for the boy her parents wouldn’t let her see when she was a teenager. The six are brought together by a quest to ‘semi-arrange’ a marriage for Kiran. She’s tried doing it her own way and made a hash of it, so it’s time to get the Hindi-Bindi club and their daughters roped in to find her a man in the more traditional way. There are of course some men in the book but their role is pretty secondary. They are husbands, ex-husbands, suitors and fathers. Kiran’s father Yash is perhaps the most significant a man who can’t come to terms with the idea of being a warm, loving, nurturing American dad when all his upbringing and instincts are to be hyper-critical disapproving Indian father. The Hindi-Bindi Club was recommended to me by my husbands pal Dal a roughty toughty British-born Punjabi with a fiery temper and a license to break bones at work (he works in a high security prison he only breaks them when he has to). He’s not the type of person I expected to read, let alone recommend something that was quite such ‘chick-lit’. Clearly there’s a romantic soul in every Punjabi boy who’s been forced to watch too many Bollywood blockbusters. This is Indian-American chick-lit, pure and simple. The names may be exotic, the locations as they flit back and forth to India are colourful and well painted but at core it’s just another story of girl meets boy, girl divorces boy, girl gets family and friends to find her a new boy. There’s a twist in how she finds her Prince Charming and how he manages to both be simultaneously perfect and completely wrong and most readers will spot what’s going to happen way in advance, but it’s still a pleasant, gentle tale of belonging and fitting it, fighting your demons, finding ways to bring the old ways and the new ways into harmony and taking solace in the power of friendship and of understanding your roots. Between each chapter we’re given a recipe, sometimes several, usually relating to one or more of the dishes that’s been mentioned in the previous chapter. I found these utterly redundant and annoying and skipped every one. If I want an Indian cookbook I’ll buy an Indian cookbook I won’t go looking for recipes in the middle of a novel. My sister by contrast picked up the book, ignored the story and just read the recipes. Nature or nurture, I’m not sure but it’s hard to believe we share the same genetic material! It’s not entirely clear who the target audience for the Hindi-Bindi Club is supposed to be. Surely American-born Indian women will not be interested in the recipes and will be a bit shocked that so many of their ‘sisters’ seem to be marrying out. They’ll also surely find some of the over-explanation of Indian ways a bit annoying. For the general non-Indian audience, the book is sometimes over-detailed and at other times skips explaining things that probably won’t make sense if you aren’t already au fait with how such things work. However, if you keep it light, don’t expect too much insight or social commentary, it’s a nice gentle, not too intellectually challenging story about the immigrant dream, what can go wrong, and the redemptive power of family and friendship. It’s not great literature but it’s a good solid read that will please many and won’t offend those who normally loathe chick-lit as much as I do. No Comments on "The Hindi-Bindi Club"